Pelicans are grandiose and powerful flyers, sailing on coastal headwinds; they are capable of flying so close to the water that the tips of their enormous wings practically touch the sea. The pelican persists in diving, time and time again, into the sea, with great force and exuberance. The pelican may only catch a fish every now and again, perhaps only a fraction of the dives will be successful. And cheerfully persists – never once judging the effort or begrudging the lacking success rate. We must keep trying, always, and remain in great spirits even as we persist. We must ride the headwinds. We must fearlessly move across the water of our emotions, never resisting coming too close, or diving right in! 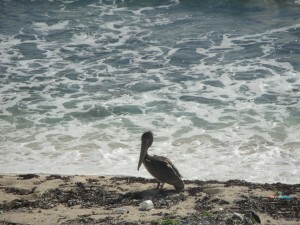 The pelican trusts in the abundance of the sea and the grace of its fabulously powerful wings. ← February New Moon in Aquarius!